MOX Happy Hour – Entrepreneurship and Free Beer! What’s on? MOX’s excellent Happy Hours offer startup networking and expertise on tap – and that’s not all! MOX are upping the frequency of their ‘Happy Hours’ over the summer to every Friday at their centre in Yuanshan. The events feature a different speaker each week from MOX’s international mentor network or local experts. The talks are primarily focused on startups and mobile internet but this carries over to embrace topics as diverse as the lean startup philosophy, artificial intelligence, drone racing, hiring practices at top tech companies, mobile marketing trends, how to use your data, and so on. 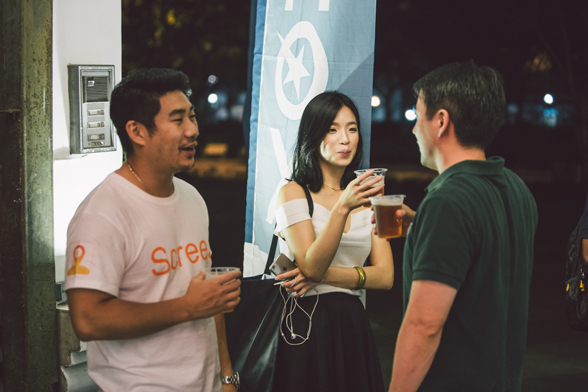 MOX’s Happy Hours draw a multitude of people from the startup scene in Taipei and so offer excellent networking opportunities as well as a chance to get some advice from some of the top achievers in the international startup community. The Happy Hours kick off at 6.30 with an opportunity to mingle. The actual talks generally seem to start at around 7 and, depending on the questions from the floor, last from around 1 hour to 90 minutes. Afterwards there’s more time to enjoy networking supported by two local startups – the rather excellent Churchill’s sausages and local brewery Redpoint. Yes, that’s right, free sausages from the barbie and lager/IPA are on tap. Soft drinks and snacks are available too. MOX’s stated mission for the Happy Hours is to inject fun in Taipei’s startup scene and we have to say that the ones we have attended so far have been both informative and rewarding. And if you’re not quite ready to call it a day when they wrap up at 9.30 you can meander across to Triangle, where you can get half price entry until midnight with your MOX sticker. The many hats Stephen wears include founder of bespoke Mobile App development consultancy Ikuramedia (https://ikuramedia.com/) mentor to Chinaccelerator (Shanghai), and Angel Development investor for Splitforce (https://splitforce.com/). As you may have deduced from the title of his talk he is also a drone racing enthusiast. When: Every Friday up through Aug 18.